Bees see the world almost five times faster than humans, according to new research from scientists at Queen Mary, University of London. This gives bumblebees the fastest colour vision of all animals, allowing them to easily navigate shady bushes to find food, write Dr Peter Skorupski and Prof Lars Chittka in the Journal of Neuroscience. The ability to see at high speed is common in fast-flying insects; allowing them to escape predators and catch their mates mid-air. However, until now it wasn't known whether the bees' full colour vision was able to keep up with their high speed flight. This research sheds new light on the matter; suggesting that although slower, it is also about twice as fast as human vision. Dr Skorupski, who carried out the work at Queen Mary's Research Centre for Psychology in the School of Biological and Chemical Sciences says; "We can't easily follow a fast flying insect by eye, but they can follow each other, thanks to their very fast vision. How fast you can see depends on how quickly the light-detecting cells in your eye can capture snapshots of the world and send them to your brain. Most flying insects can see much quicker than humans, for example so they can avoid getting swatted!" 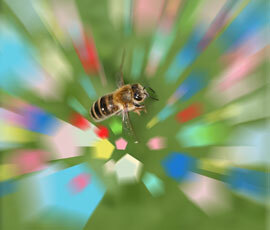 Bumblebees use their advanced colour vision in many ways. Dr Skorupski explains: "Bees were the first animals that scientists proved to have colour vision, and they have since been shown to put it to good use; navigating dappled light and shady areas, recognising shapes like their hive entrance, and particularly for finding nectar-bearing coloured flowers." The experiments show that the bees burn more energy to see in colour than they would to see in monochrome (black and white), raising questions about how they make the most of it. "Bees' energy can't be used frivolously, as they need so much of it just to stay alive. It seems they only see colours at half the speed they see white light, which give them enough detail to find their favourite flowers and navigate back home," suggests Dr Skorupski.